Earthworks of the medieval deserted settlement of Egmere and the ruins of St Edmund's Church can be seen. The church tower still stands. A manor house and associated formal gardens have been located close to the church. Earthworks of small tofts and a system of fishponds have also been identified on either side of a hollow way. The settlement is recorded in the Domesday Book and had less than ten households in 1449. Fieldwalking has recovered Roman, Early Saxon, Middle Saxon, Late Saxon, medieval and post medieval finds. A Bronze Age copper alloy knife was found by a man walking his dog. Three scheduled areas of earthworks of the village. Earthwork hollow way, tofts, etc. of deserted village. Ruins of St Edmund's Church. Village was recorded in Domesday and had ten householders in 1428. Late 13th to 14th century green glazed pottery and 'a ring'. 5 October 1977. Visit by E. Rose (NAU). Low mounds under pasture in area north of road. Ruin Cottages, south of church, were recorded as having a medieval corbel on wall by R. R. Clarke (NCM) and a being derelict by J. Goldsmith in 1970. They had recently been restored in 1977. Contain reused stone (but corbel was not found). 17th century chequered brickwork and 19th century curved bay. Originally one set of houses, central set demolished to make two deteched cottages. Brick-lined deep well. E. Rose (NAU) October 1977. Context 1: two Grimston Thetford bowl rims, medieval glazed and coarse sherds, two post medieval sherds. Context 2: one Roman sherd, five Thetford rims (jars) and one bowl rim; much medieval glazed and unglazed wares; miscellaneous sherds perhaps Thetford types. Context 3: two Roman rims, two Thetford type bowl rims probably grimston Thetford, one Ipswich ware body sherd, many small medieval sherds, few glazed, many rick or tile fragments. 10 March 1981. Casual find. On surface inside church. One third of Bawsey tile in Eames design V.
25 March 1981. Visit. St Edmund's Church. Part demolished around 1550. Remains converted into a barn and stable in 1602 by Sir Nicholas Bacon. Impressive 14th century tower. Tower was added in the 14th century onto an existing nave which was demolished at a late date and rebuilt. A. Rogerson (NAU) and E. Rose (NAU), 25 March 1981. Summer 1983. When walking dog on field known as Egmere Breck on surface of field. Context 5: bronze knife apparently made from pointed end of broken sword or rapier blade. Just enough of original surface left in patches to show tapering section at both ends is original and nopt result of corrosion, so object is virtually complete. Middle to Late Bronze Age. See drawing (S4) in the Illustration Library. Identified by J. J. Wymer (NAU), 8 September 1983. E. Rose (NAU) 20 September 1983. Roman, Middle Saxon, Late Saxon and medieval pottery. Roman coin. See coin list in file. Medieval cast vessel rim fragment. Two lumps of copper alloy metalworking debris. 1994 to 1996. Metal detecting finds. Two Roman coins. See coin list in file. See updated (S1) which states manor house stood on the site of Ruin Cottages. 29 July 1996. NLA air photography. Earthworks of deserted medieval village. Ruined church and house are visible. May 2003. Fieldwalking. Collection along two transects during geochemical sampling survey. Roman, Middle Saxon, Late Saxon, medieval and post medieval sherds. A. Rogerson (NLA) 21 May 2003. --- Aerial Photograph: TF 8937ABT-ACD; ACS-ACW. --- Article in Monograph: Cushion, B., Fenner, G. and Goldsmith, R. 1982. Some Deserted Village Sites in Norfolk: VII. Egmere. Trowse, Horning, Deserted Medieval Villages. East Anglian Arch. No 14. pp 84-90. --- Monograph: Batcock, N. 1991. The Ruined and Disused Churches of Norfolk. 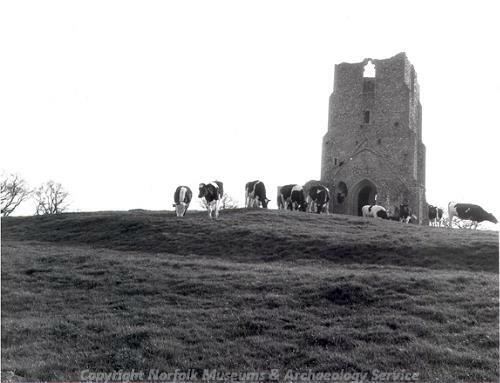 East Anglian Archaeology, 51. Microfiche 5:G12. p 134. --- Aerial Photograph: Edwards, D.A.. 1995. TF8937/ACE- ACK; TF8938/C - J. --- Aerial Photograph: Edwards, D.A. (NLA). 1996. TF8937/ACL - ACR. --- Photograph: Batcock, N.. CIX 109 and CX 110. St Edmund's Church..
--- Photograph: Ashley, H.. G7580A, G7581 and G7775. Egmere..
--- Photograph: 1965. Egmere Church..
--- Newspaper Article: Dereham and Fakenham Times. 1991. 2 February. --- Photograph: 1989. Ruins of St Edmunds Church, Egmere. Print. --- Archive: Clarke, R. R. and NCM Staff. 1933-1973. Norwich Castle Museum Record Card - Medieval. Walsingham (Great) . <S2> Monograph: Cushion, B. and Davison, A. 2003. Earthworks of Norfolk. East Anglian Archaeology. No 104. p 33. <S3> Article in Serial: Allison, K. J. 1955. The Lost Villages of Norfolk. Norfolk Archaeology. Vol XXXI pp 116-162. p 147. <S4> Illustration: Wymer, J.. 1983. 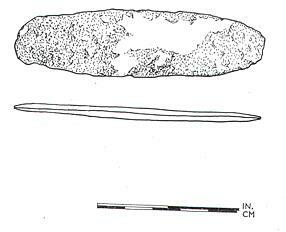 Drawing of a Middle/Late Bronze Age knife.. Card. 1:1. <S5> Illustration: Unattributed. Unknown. Sketch plan of St Edmund's Church.. Film. 1:100.